Yarn Nook: February Knit-a-longs ~ 3 this month! 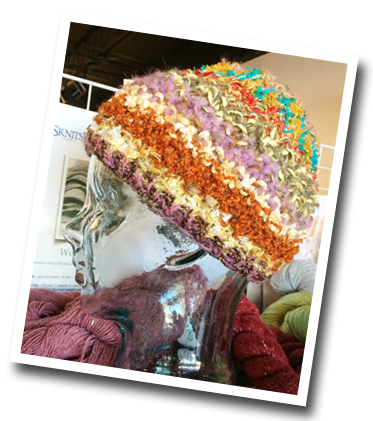 This month we will be knitting the colorful Fiesta hat. This fun to knit hat will take you no time at all to complete. Feza's Fiesta yarn is great to work with and makes a very impressive finished project! Come by the shop soon to choose your yarn and to sign-up for the KAL ~ you will receive 15% off your knit-a-long supplies this month. We will meet on Wednesdays in February (1pm - 3pm). There is no charge for the KAL with the purchase of all supplies from the shop. In February we will also be knitting a beautiful Feza Blanket with amazing Fiesta yarn. Playful colors and a simple pattern will make this a stress-free and fun knit that is sure to impress. We will meet on Tuesdays in February (10am - 12pm). There is no charge for the KAL with the purchase of all supplies from the shop. This month we will continue to work on the online Mystery Knit-a-long hosted by SKnitsB on ravelry.com ~ if you haven't yet signed up, it's not too late to join us! In order to participate in the mystery knit-a-long, please purchase the pattern for $6 on ravelry, and let us know so we can sign you up with SKnitsB for the knit-a-long prizes. Join us for this fun adventure as we knit a mystery project together ~ we will meet on Wednesdays in February (1pm - 3pm). Stop by the shop today to sign-up and to choose your yarn.